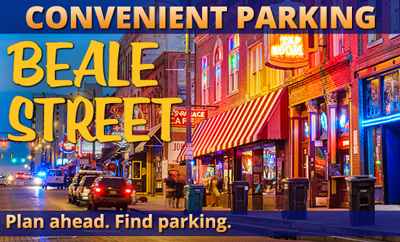 Parking.com has convenient parking near Beale Street. Refer to the map for more information on nearby parking. Beale Street is Tennessee's top tourist attraction, and one of America's most iconic streets. The street offers many restaurants and nightclubs for visitors and locals to enjoy a night out. As the Official Home of the Blues, Beale Street features the Brass Notes Walk of Fame, Handy Park, the Withers Collection Museum and Gallery, and W.C. Handy Home and Museum. A variety of events are also held on Beale Street throughout the year, including the Kix on Beale summer concert series, International Blues Challenge, St. Patrick's Day Parade, Beale Street Wine Race, Hot Rods on Beale, Bike Night on Beale, Big Wheel Relay, Fright Night on Beale, Memphis Holiday Parade, Liberty Bowl Parade & Pep Rally, and New Year's Eve on Beale.